Rediff.com's Vipin Vijayan, who is travelling with Prime Minister Manmohan Singh to Japan, reports from Tokyo. 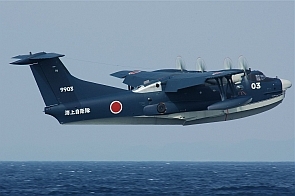 India and Japan on Wednesday took the first step towards formalising a pact related to the sale of the US-2 amphibious aircraft for the Indian Navy. During their annual summit level meeting in Tokyo, Prime Minister Manmohan Singh and his Japanese counterpart, Shinzo Abe decided to establish a Joint Working Group to explore modality for the cooperation on the US-2. The aircraft can be used for both defence and civilian purposes. Indian officials say that the JWG will assess if the US-2 fits into Indian requirements besides exploring the option of co-producing the aircraft. The deal -- if it goes through -- would be the first of its kind for Japan which has been maintaining a pacifist stance since 1967. The Japanese military exports ban restricts the export of weapons systems and other equipment. Senior Japanese administration officials though feel that the ban is self exposed and that there is no need for a contitutional amendment to facilitate the sale of the aircraft. As of now, the plane could be deemed to have a non-military (search and rescue) purpose if "friend-or-foe" identification systems were disabled, officials said, making it eligible for export. The US-2, developed by ShinMaywa Industries, has been sold to the Japanese navy at a price of roughly 10 billion yen. It has a range of 4,700 kilometres and can land in seas with waves of up to three metres. Designed for air-sea rescue work, the US-2 is operated by the 31st Fleet Air Wing of the Japan Maritime Self-Defence Force of Japan’s ministry of defence. Including its predecessor the US-1, STOL amphibians have been dispatched over 900 times to rescue victims of maritime accidents.